Footer in most websites remains as one of the most underestimated and neglected areas lacking any specific attention in the overall site design. Every page contains footer and effectively utilizing this area you can add immense value to your site. Footer is not the area where users expect too much and you need to offer great content or impressive design, but it is the area that should contain useful information and add value to the overall usability of the site In your web design footer should always hold a special place of importance and make a consistent as well as prominent presence in the makeup of the site. 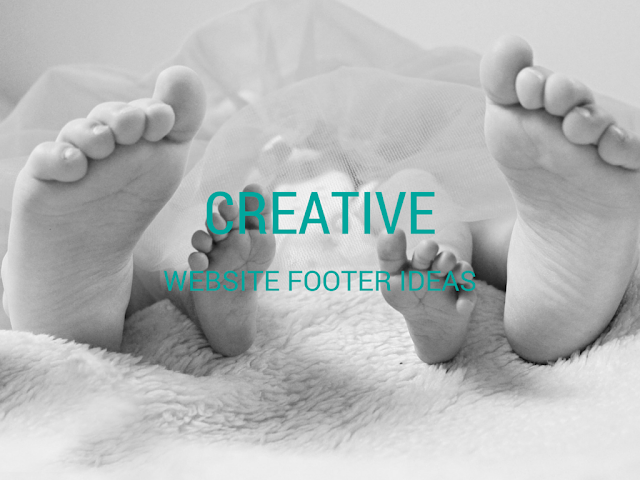 Let us offer here some really effective ideas and tips for creative use of footer in your website. You may also like web design trends in 2015 and web design trends in 2014. The website should not be felt like a foreign design element in the makeup of the site. It should be coherent and consistent to the design element of the site. Adding box in the footer that does not match in color or design aspects to the page is a common fault. The footer should be felt like irreplaceable part of the site design rather than a separate part. Maintain consistent approach in the site design including footer. Color, texture, grid, typography, font size, color hierarchy, all should match the overall site design and should not be felt as a foreign element. Footer should contain only relevant information. Hiding social icons in separately entitled page (‘About Us’ or ‘Find Us On’) is already considered to be an old fashioned design approach, especially when instant on-page social activities are so popular for most users. If you are keen on making people see and engage with your activities in social pages like Facebook, Twitter, LinkedIn, etc., add these social icons in the footer. Adding small social feeds in the footer is another way of telling users about your increasing fan base and social activities. Remember the following aspects corresponding to this. The best place for social icons in the footer is just next to the contact information. Social icons should be appropriately sized to match with the design elements. If you have strong focus on social channels small social feeds are highly recommended. Social feeds in the footer offer real time testimonials of your users and customers. Social feeds show your growing popularity and potential. Social feeds show your constant social focus and engagement. Giving users something important to do from the footer is a good design approach. This is one way to make the footer more engaging and interactive. Instead of just providing information or links you can let users fill a form, select an option or make a choice. These "call to action" features in the footer will help in business conversion through the use of footer. Consider the below mentioned options and aspects. Include a newsletter signup box. Offer an option to follow your social media profile. Give them options to subscribe to services. Make this ‘Call to action’ feature as easy, simple and contextual as possible. A full ‘Contact Us’ page is unarguably important. But providing basic contact information in the footer can also be a great idea, especially for businesses that people need to contact every now and then. Here are some aspects to remember when providing contact information in the footer. You should not consider this as replacement for ‘Contact Us’ page and so should include only basic contact details including a phone number, business email and physical address. The contact information in the footer should look clutter free with enhanced readability. Sometimes a small text that offers an intriguing or funny or valuable message corresponding to the brand or business can make a great footer. Though it depends on how the text actually relates the business or site objective, other elements like text font, typography, and use of color is also important. Here below there are some aspects to consider in this regard. Make sure that the text is contextual, intriguing and funny enough to orient users at a glance. Appropriate typographic elements coherent to your site are very important. Whether using handwriting or formal fonts or illustrious calligraphy, make sure they are readable and perfectly match the mood. Sometimes a carefully chosen image tells a lot about your business. The image used in the footer should have elements that are crucial to your business offerings and it should be eye catching as well to draw user attention just at a glance. Here are some aspects to consider in this regard. Select an image that holds some charm and portrays your business value. The image can be an animated figure, an object, a person or anything as long as it perfectly depicts your brand or business. Make sure that the image presented in the footer is of high quality, clear and is augmented with surrounding design elements like footer color, accompanying text, spacing, size, etc. Add logos or graphic elements . For a business marketing their credentials by portraying graphic logos of reputed clients in the footer is a great idea and this design practice already became hugely popular among tech business websites catering to renowned brands. The effect can be further augmented by accompanying small text as testimonials from the representatives of these brands. Consider the following aspects while adding logos in footer. Make sure that the logos are correctly displayed with the brand catch line. Make a visual hierarchy of presenting partners, sponsors and clients when presenting their logo. When presenting logo with small testimonials make sure they are readable enough and do not cause visual clutter. The use of negative space or blank space is important for every different web design aspects including footer as well. Footers are generally used in site locations that are struggling for space. Naturally, often footer elements either cause a visual clutter or just make readability suffer. Using blank space appropriately can offer a solution to this problem. Make sure footer links offer enough space for finger tap or easy mouse click. Avoid using too many elements in footer. As footer stands at the bottom of overall website hierarchy, it should also offer a hierarchy of elements. This hierarchy apart from placing of contents should be reflected in visual elements with color and fonts as well. Here below some of the important aspects to consider. Contact information and site map should get the priority in this hierarchy. Standard and statutory information like that of corresponding to copyright can be less prominent. Visual prominence and graphic hierarchy should be indicative of where to go and give importance to. A footer within a footer which is often called as sub footer is a nice way to offer contents in layers and add further to the visual hierarchy or prioritizing elements. Consider the below mentioned aspects when considering sub footer. Call to action links and features should get the priority in this layering. Site links and site map should also get higher priority. Disclaimers, copyright and statutory information should be at the lowest layer. Footer like other design elements in your website plays an important role in creating an impression relating to your website. As a designer this also shows your meticulous approach to details in design elements. A blank or poorly designed footer ruins your good work in the overall design. The above mentioned ideas and tips hold some indication as how creative use of footer can augment the site design and usability. Keval Padia is a Founder & CEO of Nimblechapps, a fast-growing android app development company. The current innovation and updates of the field lures him to express his views and thoughts on certain topics.